We’ve all been there: walking around in public smelling like a Moroccan hash-field in the summer thanks to a pocket full of well-cured cannabis purchased at your favorite coffeeshop; or wisely grown at home. Sure the pungent smell of weed can be unwanted at times, sabotaging its discreet transportation. But did you know it could also help you pick out the perfect cannabis strain for your personal needs and desires? ‘Ugh, it smells like weed here’, we’ve all heard it at one point in our lives and hoped eyes wouldn’t turn our way. This is all thanks to the plant’s terpenes. Compounds that naturally occur in cannabis and, by existing in different combinations, make up each strains’ unique smell. These terpenes, so undesirable when trying to be discreet, do not only give each cannabis-variety their distinctive aroma we as consumers usually adore. They’re actually very handy in helping you select the right strain for your needs. Because the terpenes found in cannabis are also responsible for the specific effects cannabis strains can have on our bodies and minds. Yes, that is correct: the smell of the weed determines the effect of it when smoked, vaped or consumed otherwise. When it comes to cannabis, smell equals effect. 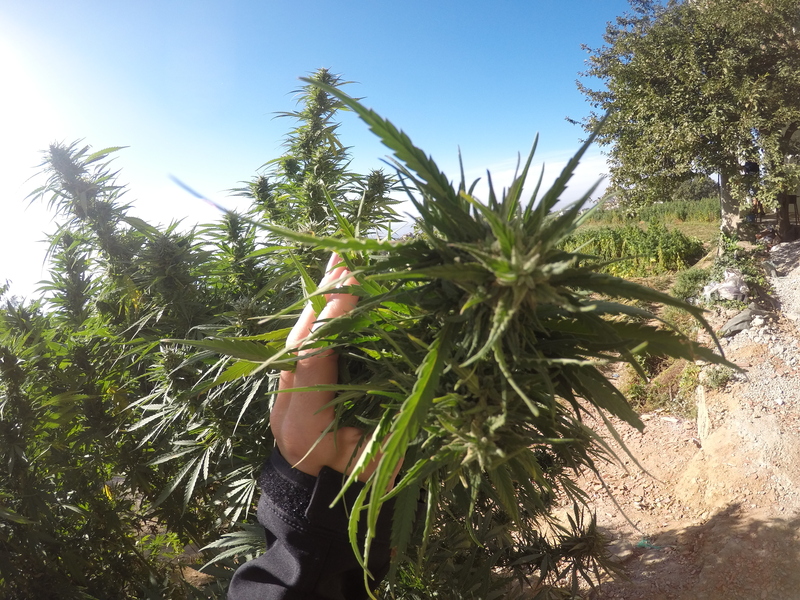 Although the plants well-known cannabinoid delta-9-tetrahydrocannabinol (THC) usually has to be present to provide an effect, a strains’ specific terpene-profile steers its particular outcome. Making the effects of sativa-dominant flower more creative and uplifting and that of indica-dominant strains more relaxed and sleep-inducing. 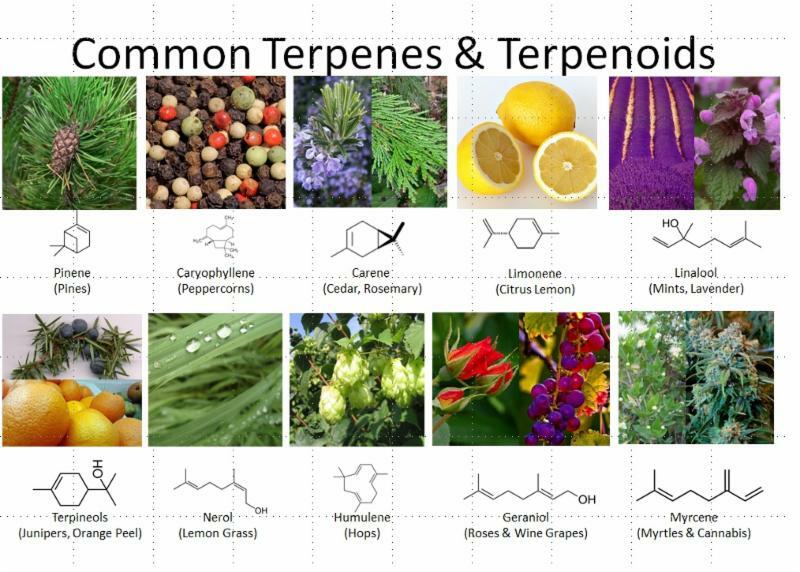 All dependable on the specific combination in which these terpenes exist in a certain strain, of course. Now that we’ve determined that smell equals effect, it should be very easy to guess the effect a strain should provide judging by it’s aroma. Right? Right! If your are looking for a strain to lift up your spirits, boost your creativity or provide that energy to clean the house – you are best off choosing a sativa-dominant cannabis strain. This is something most cannabis users already know from experience, but not always realize. Strains like Amazing Haze and Lemon Ice are often recognized by a complex citrus aroma, like fresh lemon-zest. This is due to a well-known terpene known as limonene, which provides a stimulating and psychoactive effect on the mind. Besides cannabis, this terpene is also found in lemons, rosemary and peppermint; and can therefore smell like these herbs as well. Funny enough, the components you breath in to be able to smell a lemon or one of these other plants, are exactly the same as when you smell our Lemon Ice for example. The limonene in that lemon is exactly the same as the limonene found in cannabis plants. Another smell to look out for when you’re in search of uplifting cannabis strains, is pine. Spicy pine-smelling cannabis buds like Super Silver Haze, are usually rich in pinene, an energy boosting terpene with a positive effect on the memory. On that account, when using your nose to select a strain that’ll lift your spirit, lemon, rosemary, peppermint and pine could be some smells to look (or smell) out for. Are you in the market for a calming, sleep-inducing or physically relaxing experience though? Don’t bother with the sativa’s, as they will provide an opposite effect to what you’re looking for. Rather go for one of the many indica-dominant strains available. These, in contrary to their uplifting brothers and sisters, contain a whole lot more of the terpene myrcene. Indica-dominant strains and mangoes have one thing in common: myrcene. You can recognize this relaxing, sedative compound as an earthy, musk-like aroma, prone to some of the most famous cannabis strains around the world. Though myrcene can also smell sweet and fruity, like red grapes and balsamico. It is mostly perceived as a complex, gassy nutmeg-like smell; like you’d find in our Blue Magic, Kosher Tangie Kush (in the picture above) or AK-OG Kush for example. Another indica-like terpene is linalool, recognized by its floral, lavender-aroma. 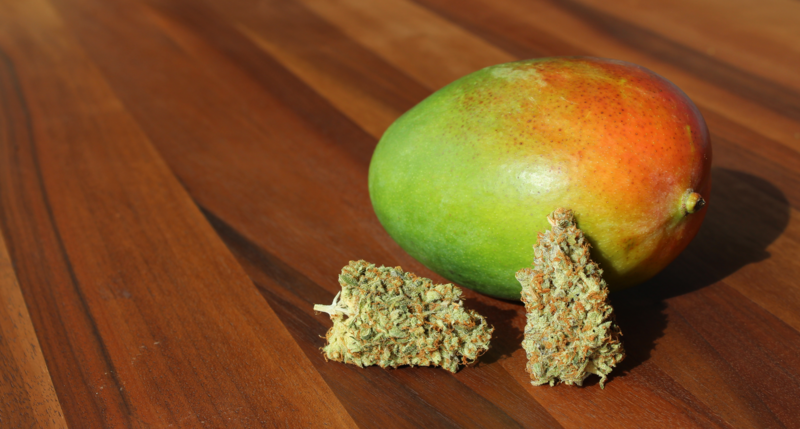 Surely most cannabis consumers have heard this little fact before: eating a mango before you smoke a joint boosts your high. And it is true, completely and utterly true. Eating a ripe mango before a smoke session could very well boost the effect of the smoked weed. Why, you may ask? Terpenes, of course, that’s why! Mangoes (especially the riper ones) are rich in myrcene. Eating on, around half an hour before you have a smoke, could even be enough to enjoy an indica effect from smoking a sativa-leaning hybrid. So next time you decide which strain to smoke (or grow), why not follow your nose?